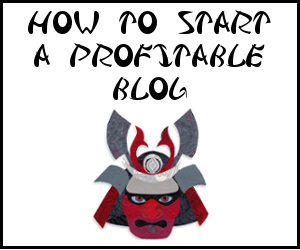 For the first two and a half years of blogging, I don’t think I had a single affiliate post. Reading other blogger’s affiliate posts sometimes made me cringe because it was evident most did not use the products they were pitching. Over the years, I’ve seen plenty of blogger’s completely lose their audiences and quit because their blogs became all about making money online. When money is your primary focus, and you aren’t making enough of it, things get disheartening really quick! I want to always write for fun. Anybody who visits Financial Samurai knows that I have a lot of opinions which sometimes doesn’t make you feel warm and fuzzy. The truth often hurts, but sometimes it’s a great way to break through. When I decided to retire from the corporate world in the first half of 2012, I finally got serious about the business of blogging in part because I no longer had any W2 income. The challenge was exhilarating! Within three months after leaving my job, I finished writing my book, How To Engineer Your Layoff: Make A Small Fortune By Saying Goodbye. The experience of creating my own product and the time spent marketing the book has led me to positively change the way I look at affiliate income forever! The book was a two year process in the making. 2010 was the year I began planting the seeds for my escape as my passive income streams grew to self-sustainable levels. Over these two years, I studied local employment laws, read my employee handbook multiple times, built relationships with HR managers, sat down with employment lawyers, and consulted with over a dozen friends about their separation agreements, so that I could comfortable make my own move. When I finally locked down my separation package I decided I had to put everything I learned on paper before the knowledge started to fade. For three months, I wrote for five to eight hours a day. 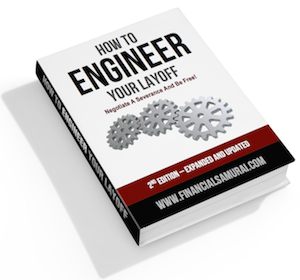 I went back and interviewed 10 people from various backgrounds I had worked with to help engineer their layoffs and chose five case studies for my book. After working on the first five drafts alone, three more editors made over 30 revisions until we were finally satisfied with the 100-page product. I then worked with Sydney on the design, layout, and marketing plan. Even when I was sure the market desperately needed such a product, I was still hesitant right up to the point of launch. But since the launch, hundreds of the books have sold, new consulting clients have been found, and many inquiries have hit my inbox every single week about how to profitably breaking free from the corporate grind. The best part is, I haven’t even gotten started with the heavy marketing yet! 2) You become an expert. There are plenty of books about how to get a job, but there is curiously no book on how to leave your job. People don’t realize that they are leaving enormous sums of money on the table if they quit. As the author of How To Engineer Your Layoff, I have to constantly be on top of new negotiation strategies, legislation, and news about the subject. Clients are counting on me to know what I’m talking about! Once you become an expert in your field, you get even more opportunities to elaborate your knowledge. 3) You develop greater congruency. I didn’t realize until after I published my book that I have been a long time fanatic of the career genre already! If you look at my Career & Employment category, there are 130 posts on the subject. If you then take a look at my Retirement category, you’ll find another 180 posts! All along, I’ve been writing post after post that relates to my book. Not only do the 300+ posts buttress the authority of the book, the book powers up the authority of my existing posts! 4) You come up with endless content. The reason why my queue of fully-written posts jumped from 30 to over 50 after I wrote my book is because of the endless amount of content ideas that started coming up post publication. It’s as if your mind goes on overdrive to write new content related to your expertise. If you fear you will ever run out of blog content, write a book. One of my favorite posts is, “When A Severance Package Is Not A Severance Package” because it directly addresses an issue many people who leave their jobs face and do not understand. 5) You get a traffic boost. Now that you have a product, are developing yourself as an expert, and generating more content, your overall website traffic begins to naturally increase! Everything you write becomes better because you know more people are watching you. My traffic on Financial Samurai jumped by over 50% a day on average post my book launch every day until now. Perhaps a Google algorithm had something to do with it, but I’m willing to bet money that my book was the bigger reason for such a traffic step up. The book itself contains many of my top posts related to career, retirement, and wealth generation which clients inevitably click on. Furthermore, you can’t discount the effect of illegal sharing that has a knock on effect on traffic. 6) You get more offers. Success begets success. If you truly create a product you are proud of, you will undoubtedly deliver great value to your clients. Authors get invited to speak at events, go to random parties, and get first looks. There’s an entire culture out there of creators who invite you into their circle once you’ve produced. Part of the reason is because they know how much it takes to create. If you go to war together and come out alive, you instantly become friends for life. The other reason for the welcoming is the fact that failure rate is high. We look to help support each other, much like we do here at Yakezie. 7) You learn incredibly fast. When your reputation is on the line, you do everything it takes to learn to succeed. Because I never wrote any affiliate posts before my book, I didn’t understand how to write in a way that could not only provide value, but also make a sale. I now understand the concept better. Writing effective affiliate posts takes practice. “What Should I Do Before Quitting My Job? 15 Things To Consider” is an example where I address problems, fill needs, and provide a solution. 8) You make some money. I’m unlikely going to get rich with my book at currently $48 a copy, but earning an extra couple thousand bucks a month potentially forever is better than a sharp stick in the eye! The book has also led to some new consulting clients which I am absolutely enthused with helping. 2013 is the year where I will proactively build my affiliate program, targeting career, entrepreneur, and lifestyle sites which fit my book’s message. 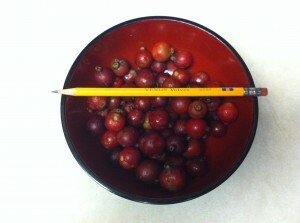 If you are interested, let me know as I’ve spent 2012 honing the product based on feedback. 9) You increase your motivation. It’s easy to get lazy in retirement. All your hard work, saving, and investing is now being enjoyed with the remaining time you have left on earth. The problem is, once you’re financially independent you get a little bored if you don’t have a cause. It’s also easy to do the same thing over and over again as a blogger. Creating something of your own for others to criticize or enjoy keeps you on your toes. Your creation is your baby, and you do everything possible to keep it growing. 10) You get closer to self-actualization. After achieving physiological, safety, love, and self-esteem needs, there’s this nebulous term called self-actualization. The theory is that once you fulfill all the needs below, only then can you find the pinnacle of happiness. I hope I wasn’t just put on this earth to teach people how to profitably quit their jobs and take control of their own lives, but maybe! 11) You develop an incredibly think skin. If you try to sell something, even if it is a product which cures cancer, you will run into your share of skeptics and haters. If you have a thin skin, you will probably give up. But, the thicker your skin, the higher your chance of succeeding because you will continuously improve your product to show your doubters wrong. Through hardship comes wisdom. I firmly believe most who fail aren’t able to push through the dips and give up too soon. We’ve got to be honest with our products as well. We may think we’ve got the greatest thing since sliced bread, but if we aren’t getting any sales or positive reviews, we need to improve our products. 2) Don’t stop listening to feedback. No matter how painful the feedback, welcome it! Now make alterations based on the feedback to make it better. Chances are, if someone has an issue, many more people will also have an issue. 3) Continue adding features. Once you’ve got your basic product out, continue adding new features over time. With an informational product, simply add new chapters, new videos, or addendums. With a physical product, surely you can always build a better design with improved performance over time. Just look at cars and electronics. 4) Take risks over multiple platforms. Writing your own content around your product is obviously a great strategy if you have a blog. Guest posting is another good strategy to reach a different audience. Meanwhile, doing podcasts or radio interviews are great too. Marketing takes time. Give yourself at least six months of putting yourself out there before doing an honest assessment of your results. 3) Start over. The great thing about failure is that if you try again, you improve your chances of success because you know what you did wrong. The people who succeed try over and over again. They don’t let a setback keep them down. I truly believe that if you can focus on creating the best product possible, sales will come. The internet has made it easier than ever to share things you like to your friends. Only after you are comfortably with your creation should you then spend a majority of your time on marketing your product. A product you are proud of becomes so much easier to fly. If there’s one thing I encourage all of us to do in the new year, it’s consider creating a product of your own that revolves around your own expertise and interests. Look at your archives of your most popular posts, or the posts you find the most joy in writing. Spend an hour brainstorming a problem and a solution your product can address and go for it! Once you’ve got a portfolio of your own products you’re selling through your blog, you can make a healthy income online full-time. It’s been seven years since I started Financial Samurai and I’m actually earning a good passive income stream online now. The top 1% of all posts on Financial Samurai generates 31% of all traffic. The average age of the top 1% posts is 2.3 years old. In other words, after putting in the hours to write some very meaty content over two years ago, 10 posts consistently generate a monthly recurring income stream that’s completely passive. I never thought I’d be able to quit my job in 2012 just three years after starting Financial Samurai. But by starting one financial crisis day in 2009, Financial Samurai actually makes more than my entire passive income total that took 15 years to build. If you enjoy writing, connecting with people online, and enjoying more freedom, see how you can set up a WordPress blog in 15 minutes with Bluehost. Who knows where your new adventure will take you in 2015 and beyond! Yep, didn’t have anything for 2.5 years either, and I was super happy. And then I figured why not create my own while my thoughts and notes are still fresh in my head. Give it a go when you are ready. It’ll take a lot out of you, but it’ll also give a lot back! This makes a lot of sense that the best affiliate product is our own. I’m aiming to complete an eBook next year. It’s chipping away at it that’s going to be a big challenge for me first but I’m excited about it. I’m also trying to get more active in promoting affiliate products that I really like that fit my readers. I’ll definitely help you out on your eBook Sydney! There are so many awesome reasons to create our own product, many of which are not for monetary reasons as I write in this post. The sense of accomplishment is great. There is an affiliate product for everything. It’s up to us to find those products we use and really believe in that compliments our writing. Just got to make an effort! Go for it! It definitely takes a lot of energy, which is why I wrote my book fresh after leaving the corporate world. I was pumped about the outcome and had to write everything down to share the strategies to my audience and to new readers looking to leave their jobs for something better. The benefits from traffic and soft benefits such as improved authority are very rewarding. I enjoy promoting my own products. It forces me to become better at self-marketing, which most people are often intimated by. The best part is what you mentioned about being proud. You put so much effort into this and now it’s finally paying off. It takes a lot of work to pump out a product. When you finally do, it’s all yours and it’s out there for the world. I must chime in and say that you can’t always promote your own products though. Sometimes you have to promote other products that are related to the specific post. Definitely important to tailor your product towards your relevant content. Creating your own product is an important arsenal in a portfolio of products one can talk about. There’s an affiliate product for practically everything. It’s up to webmasters to find the most helpful ones for our readers. This was the post that finally got me to hit “purchase” — can’t wait to digest it! I see creating my own affiliate product as the next step in my blogging growth process. There is nothing I’d rather pitch to the rest of the world than something I’ve tested myself and can live by. I loved your post Sam. This is something that’s been on my mind for a while now, and something I need to put into practice very soon!! Hey Eddie, thanks man. It takes A LOT of effort to create a quality product, and once you are done, you’ve got to keep on revising. But in the end, it is worth it because of the so many benefits I’ve written about in my post. Good luck and happy blog anniversary! But I want to sell car stereos on my blog! Who cares if it’s relevant?!?!?! But seriously, I agree here, because I don’t think I could sell something unless I truly believe in it. An obvious sales pitch HAS to be genuine, otherwise the audience won’t believe you. If you created it, you must be invested in it and actually care, so it’s much easier to sell. Looking into this currently, and just need to road map the process for my coming products. Car stereo blog is in your future! Like the article, not a fan of most affiliate products, although I think the Amazon one seems fairly good. Who doesn’t shop at Amazon????? I particularly like your “self actualization and learning from mistakes angles”. My motto; keep on keeping on. Best of luck with your SALES!!! That’s the thing. Once you find an affiliate product that is absolutely relevant to your content, which will help your readers save money, earn money, or provide whatever benefit, you will love it. And if you can create your own product, even better! If I am about to do a product review, I check to see if they have an affiliate program, not the other way around. I would feel to responsible to pitch some products I have no idea about to my readers, and prefer to pass on the quick money. Enjoyed this article, Sam! Selling your own content is the best strategy. I have a dream to write a book, but no clue yet as to what I will write. I am still enjoying my blog for now, so I am sure that time will come to make the big leap in the future. Given yourself a full 18 months of writing months of writing your blog. You’ll then find categories that naturally fill up with more content because those are what you care most about and have the most fun and easiest time writing. From there, you can then narrow down your focus. For me, retirement and career were the two biggest categories with over 250 posts. When I finally engineered my layoff, I knew I just had to write my book while all the info was still fresh. Very well said Sam. You are rights, we should creates hard our own products that we should be proud of, and also will help us to earn extra money. We make money from passive income through royalty fee of our information products. Can I ask you Sam, if you don’t mind? Who help you to edit your books before you release it here? Sure. After reviewing the work about 15 times myself. I then had my good friend Sydney from Untemplater review it 7-8 times over the course of three months. I then asked my father who spend his career in writing review the work another two times, and then I had a part-time editor look it over three times as well as work on formatting. It was an exhaustive proces to say the least, but errors often lie in plain site, undetected by one person, no matter how many times they look. I did another full review last week and cause a minor mistake as well and updated it. I also listen to all the feedback from my clients and continuously improve the product based on their feedback. Interesting post, FS, seeing as how I wrote the post about re-engaging my marketing strategy for my personal finance book, How We Prevent Wealth, only a few days after this post launched. It is though we are connected spiritually. :-) Seriously, though, this was very inspiring and just an added boost to my very own thoughts to do my best to increase my book sales in 2013. Good to hear it Romeo! I wish you the best for 2013 with your book! Creating and learning are my favorite activities. When I am ready to launch a product, I definitely have this post bookmarked! I’m not a fan of affiliate products. To be honest if a payday loan company approached me and offered me a stack of cash to promote their product I would be hard pushed to find a nice way to say “No”. There are some products which could nicely fit into my brand but I think promoting a product should be done without an eye on money. I know I’m not looking to make money out my blog, well I’m 4-5 months in so maybe it’s too soon to tell, but I can’t see me with a commercial mindset. I write about what happens, or has happened and I think that gets distorted when money becomes a factor.